With guidance from the VP Procurement, the Jr. Purchaser shall source and purchase assigned products by developing and implementing sourcing strategies to optimize sales and profit performance, based on the concept of lowest Total Procurement Cost, in order to provide high service performance for our customers balanced with cost effective inventory management practices. The responsibilities of this position align with and support the company’s Mission and Values, and its business objective to grow sales and profitability by providing professional, high quality products and services to our customers. Food safety is critical to the success of 7 Seas. The incumbent is responsible to adopt and carry out the food safety practices of the company and to report any food safety issues to his/her immediate supervisor. Build and maintain positive relations with supply partners. Source assigned products to meet company needs based on Total Procurement Cost. (landed cost, costs related to non-compliance on quality, service, inventory carrying costs). Negotiate with supply partners to reduce Total Procurement Cost, with a focus on win/win solutions. .
Place orders with assigned supply partners. Monitor supplier performance with KPI’s for quality, delivery, service performance, invoice accuracy, and implement corrective action as required. With support from Logistics, ensure inventory for assigned products is adequate to meet service level requirements, adjusted as required to meet sales trends and changes to supplier lead time. Maintain and update cost and pricing for assigned products. Monitor margin exceptions and initiate corrective action as required. Monitor aged inventory and initiate corrective action as required. Define and recommend alternative sourcing solutions to reduce Total Procurement Cost. Develop and implement sourcing strategies to add or eliminate a supplier, based on market demand and/or performance issues with incumbent suppliers. Resolve disputes and claims with assigned suppliers. Keep all supplier programs current and accurate. Ensure continuous communication with Sales team related to market trends, cost/price, and supply/demand. For assigned import products, comply with all import and brokerage requirements, including CFIA documentation. Participate in company strategy and planning discussions. In an effort to ensure the continuity of 7 Seas food safety programs, the incumbent shall ensure that, in his/her absence, these responsibilities are covered by a co-worker. A basic understanding & experience of purchasing strategies and inventory management. Demonstrated performance with cost saving initiatives. Basic knowledge of purchase order systems and related software. Basic understanding of the principles of vendor management. Detail oriented and results driven. Strong interpersonal skills and high energy. Frisian Lady Unloads Her Catch! Yesterday, skipper Gus Linville on the Frisian Lady unloaded his Halibut caught in the waters off of Kodiak Alaska. There were some real plump, juicy Halibut in there. Keep up the good work, Gus! Fish will be arriving Wednesday for sales out of Vancouver. Call your Sales Rep to place an order. Coming to a market or restaurant near you; 7 Seas will have the first Copper River Sockeye Salmon available for sale in BC! 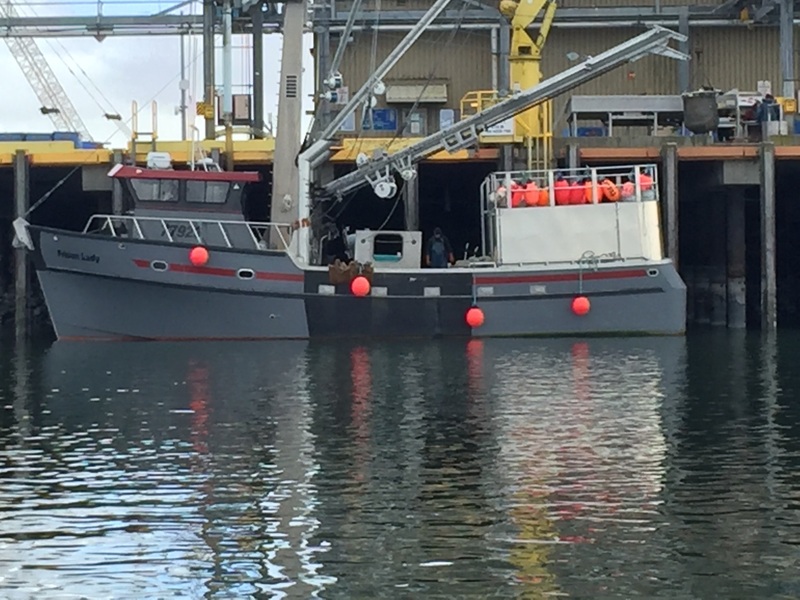 Looking to be a strong year for Copper River and the Prince William Sound fishery. The first fresh sockeye salmon of the 2013 season is here. 7 Seas is proud to be the first in Vancouver to have world renowned Copper River sockeye available now. This fish was still in the water a day and a half ago. Why all the fuss? What makes this fish world famous? Copper River Sockeye Salmon is caught in the waters of the Copper River Delta near the town of Cordova, Alaska. The river is a long river, forcing the Copper River Salmon to store large amounts of fat in order survive their long journey to the spawning grounds. It is this fat that gives the fish its rich flavour and it is the fat that is high in omega-3 oils making Copper River Sockeye Salmon a healthy addition to any diet. Food service customers contact your reps or call us at 604-247-1266 for pricing and availability. Retail customers please visit a 7 Seas retail market nearest you. For 7 Seas market locations and store hours click here. Want Fresh Salmon? Think 7 Seas, we do it best! We are very pleased to announce that the resources of 7 Seas and PASCO will be merged into one company, effective March 25, 2013. PASCO and 7 Seas share a commitment to environmentally sustainable fisheries and procurement practices. The result is a transparent approach to doing business. Both companies are committed to service and product excellence, driven by engaged employees who are passionate about meeting customer expectations for quality and service. Founded in 1967 by John Heras, 7 Seas has continued to grow and prosper as a family-owned and operated Canadian business committed to providing high quality, sustainable seafood to each and every customer. Under its 7 Seas brand, the company sources seafood globally to fulfill the needs of fine restaurants and retailers across Canada. PASCO Seafood Enterprises Inc. (PASCO) is a privately held, Canadian owned company. Under its brands including Coastal Waters, First Nations Pride Seafood, P.I. Food, and Pasco. PASCO has grown to an operation of international scope and scale, supplying seafood to leading retailers and restaurants around the globe. The PASCO management team will be joining the 7 Seas management team. As a result, the new company will have a more specialized approach to the seafood business management and a deeper bench than before. We will continue to promote all established brands. By capitalizing on the strengths of each company, our new organization will offer a broader selection of seafood to our customers, based on the principles of sustainability and service excellence. We are excited about our new organization, and we look forward to continued strong relationships with our valued industry partners. The very best Vancouver and area chefs will present tasting dishes at an evening of unforgettable cuisine in support of two great causes, Bocuse d’Or Canada and Breakfast For Learning. This event promises to be the premier culinary experience of the year and will include a silent auction featuring exclusive dining opportunities, golf packages, products from world-renowned culinary brands such as Le Creuset and much, much more. Proceeds from ticket sales will benefit Bocuse d’Or Canada and the local and regional efforts of Breakfast for Learning. 7seas is a proud sponsor of Chef Alex Chen’s quest for the Bocuse d’Or. For more information please click here. For more about Chef Alex’s quest click here. Halibut Season is coming to an end soon, so try this great recipe from our friends at Thrifty foods. Place the halibut in a parchment paper-lined baking dish. Combine the remaining ingredients in a small pot and set over medium heat until the butter is just melted. Spoon the mixture over the fish. Bake for 15 minutes, or until cooked through. Divide among plates, spooning any butter mixture in the dish over top and serve. For more on this recipe and other recipe ideas check out the recipe section at thirftyfoods.com or click here. 285 Lb Halibut must see! A sight to see! a 285 Lb Halibut was landed by the FV Sea Zone in the Gulf of Alaska by Captain Andrei Marushev and his crew. The very last hook they were pulling in at the anchor was exceptionally difficult. The crew come to find out that the last hook had a 285 lbs halibut on it. The rule of thumb is that for every 100 lbs a halibut is 30 year old so this fish must be about 75+ years old. This beast is on it’s way to the river Rock Casino in Richmond BC. 7seas: Who we are, and where we came from. A short video on who we are and where we came from. It is this passion that drives 7seas.